Summertime is finally here!!! Which to most Americans means it’s time to hit the road and traverse the highways of this great country to destinations unknown and as of yet undiscovered to you and your family. Road trips are an amazing way to travel with family and friends but they can be a little less than you expected until you get where you’re going. Sometimes what’s outside your car window maybe dull and boring for hours and hours and hours and hours. So no doubt you’ll what most people of this day and age do, whip out the iPod or laptop or iPad or perhaps the portable DVD player for some entertainment, only to discover it’s so dirty you can barely see anything on its screen! There may be your little sister’s sticky fingerprints caused by the huge chocolate bar she got at the gas station covering every inch of the screen or maybe you accidentally dribbled ice cream all over it when you fell asleep watching “Inception”. 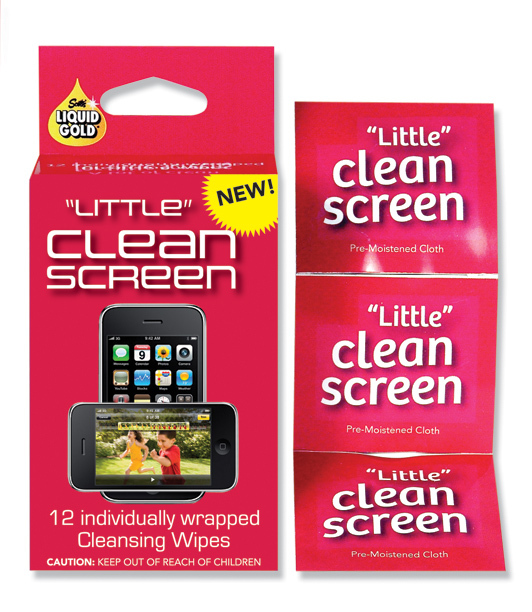 Whatever the case there’s something special that should be everyone’s glove compartments that can help, “Little” Clean Screen by Scott’s Liquid Gold! These small but powerful cleansing cloths are specially designed for use on delicate, tempered screens like those of an iPod, laptop, iPad or portable DVD player. Just take one out of its individual package and gently rub away all that dirty, disgusting-ness. Now hours of entertainment await you! Aside | This entry was posted in Clean Screen, Electronics, Scott's Liquid Gold and tagged Clean, Clean Screen, cloths, delicate, Dirty, disgusting, DVD player, entertainment, Family, friends, gentle, Ice Cream, individual package, iPad, iPod, laptop, powerful, road trip, rub, Scott's Liquid Gold, screen, small, sticky, Summer, Tempered screen. Bookmark the permalink. 4 Responses to Hit the Road! I would like to know how to buy Lemon Scent Liquid Gold by the case or more. It is hard to find in our area and is expensive. I have a business lience- Help I would in a museum and this is all we use. Scott’s Liquid Gold Lemon is available by the case on line at http://www.scottsliquidgold.com. Use order code VIP1and a 10% discount will be deducted from your purchase. Sorry for the delay in responding to you. Thanks for your interest in Scott’s Liquid Gold. i just purchased a 12 ounce can of Scotts Liquid Gold as i wanted to clean up some wood doors and cabinets in the house. I started on the upstairs bedroom doors. I used a soft cloth and sprayed your product on the doors and wiped them afterwards. What a Product! I ended up spraying every wooden door in the house and now they look brand new! I am going out to buy another can of Scotts Liquid Gold and start on my cupboards next. Thank You PS I never e-mail regarding a product but Scotts Liquid Gold really enhanced the tired woodwork in my home. I wish I bought it years ago. Thanks so much for your kind words. 60 years in business and we are still plugging along due to the loyal support of people like you. We are a small American manufacturer so every purchase means a lot toour 65 employees and their families. Thanks again!